I am so pleased to be online with Western Colorado Journeys with a fine array of artists, artisans and wineries! Pieces from my Molten Ice Dichroic Wire-wrapped Jewelry Line are displayed among many fine Western Slope artists. Looking for art, pottery, sculpture and fine jewelry; great wine, beer; or a fabulous destination - come see what we offer! A beautiful glossy Western Colorado Journeys magazine will be available very soon at your Colorado Visitor Centers, Wineries and fine stores featuring the artists and wineries. 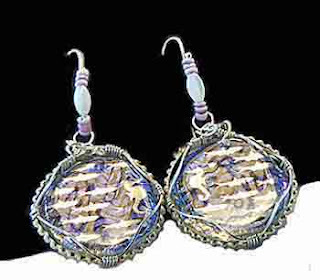 Vital Wonders Magnetic Jewelry Blog by Kim DiJulio; designer/owner at Vital Wonders Magnetic. Vital Wonders has been putting style & power into magnetic jewelry since 2003. When Vital Wonders started it was hard to find magnetic therapy jewelry. Most everything was made in China and very few of their designs were imported; it was all the same and of poor quality.
" I was amazed at how much magnetism affected my health for the better; my back pain, arthritic hands with useless thumbs, my low energy level and chronic depression. I also wanted stylish bracelets and necklaces for different outfits and looks. " Kim DiJulio mused. I dedicated myself at developing Vital Wonders to offer, women especially, lots of styles and different looks; mixing magnetism with gems, with jewelry in effective strengths; all made-to-order and of great quality and nice overall packaging. Vital Wonders has been online since 2004 going through many changes, constantly adding new looks as new beads types are found. The latest are the painted magnetic beads in miniature flower motifs or painted cloisonne-appearing designs. Please visit our online store. We have a new online look and are still rising in the search engines. Come spend some time with us. Good health!